The Starmark Treat Dispensing Tetraflex will provide endless mental stimulation and fun for your dog. Just place some treats in the centre and let your dog try and get them out. Adding fun to treat time. Starmark Treats are available which fit perfectly in this toy. 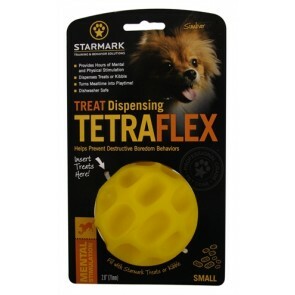 There are currently no questions for Starmark Treat Dispensing Tetraflex Dog Toy - be the first to ask one!